The online 'members only' area for Vancouver students has been updated. You should have received a news e-mail on Tuesday, April 24th containing the new password. Click here to go to the log-in page. This year's Summer Seminar for ALL is coming up soon. Mark your calendar today! The first part is on Monday, June 4th, 7-10pm. Part 2, the main event is on Wednesday, June 6th, 7-10pm. I will start sending out e-mails in regard to your eligibility to sign up for testing during the seminar. As always, this seminar too features a special topic you don't want to miss. There will be NO group class on Monday, May 21st due to the long Victoria Day weekend. Enjoy time with family and friends! The next WingTsun-ChiKung classes have been scheduled. Join us on Monday, May 28th (7-10pm) for the first class of two, featuring the Siu-Nim-Tau form. The second evening on Monday, June 11th (7-10pm) lays out the details of the second form of the Wing Tsun Kung Fu system, the Cham-Kiu form. For more information click here. Face a challenging workout. 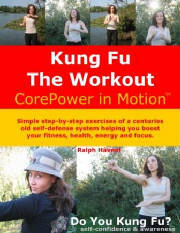 We don't call it CorePower in Motion™ for nothing! Don't forget to pick up your copy of the print newsletter for May. It will be handed out in group class on Monday, May 14th. New photos have been added to the online photo album of Wing Tsun Kung Fu Vancouver. Go to http://realisticselfdefense.tripod.com/photoalbum. The video clip of the 2003 interview at MTV Canada has been posted in the Wing Tsun Videos section at our special Open House web site at http://www.freeselfdefenseclasses.com/. April 16th was the date of yet another one of our WingTsun-ChiKung classes. This evening featured the Cham-Kiu form, often neglected but once discovered or better re-discovered a form invaluable to the progress of one's Wing Tsun skills. You will, even in the Wing Tsun system by different representatives, often notice personal interpretations, as for example the repetition of the last kick on the right side. Many have asked the question over the years addressing several of Yip Man's senior students, as to why the kick is typically performed only once to the left, without a truly satisfying answer. Once again note, Wing Chun or Ving Tsun forms are often trained with a very different focus. I mentioned in class a few general training methods. For the idea or meaning of "fast", "regular" or "slow" please refer to our classes, it is very difficult to describe with words. Very slow can mean anything from 20 minutes to three hours or longer to finish the form once! We have also talked about the fact, that the effects you might feel can differ very much from week to week. Many who train consistently and progress oriented, experience step by step changes as to what muscles will be involved, how ligaments and tendons are being accessed. You have to watch your form (in a mirror), FEEL your progress and try to push yourself every time a little bit further, move a little bit slower, pay a bit more attention to details, hold positions while stretching a bit longer. Remember, we want to progress from short-term stretching towards long-term lengthening of muscles. View the kicks of the Cham-Kiu form as slow and detailed exercises for stretching, posture, positioning, and foremost as balance exercise. Experiment during the stance turning exercises with the involvement of your ankles, knees, hips and the positioning of your spine/neck vs. shoulders and "open" chest. We have talked about the idea of the "power of the seven joints" as being an abstract picture/visualization to involve increasingly the continuous and progressive stretching between ALL opposing joints. Recently a Tai Chi expert watched our Chi-Sau training and asked me about how long (as in decades) I am practicing a particular Tai Chi style. I have never done Tai-Chi. The not so secret revelation is that styles considered to be 'inner styles' or 'internal styles' must move, must be performed in a somewhat similar way. That is why you will discover certain (limited) similarities in Wing Tsun, Tai Chi*, Hsing-I* (or Hsing-Yi), Pakua Chang*, or even Aikido and Judo. * or T'ai Chi Ch'uan, Xíngyìquán and Baguazhang, the neijia arts. Everything has its limitations, never get taken by circus tricks, the no-touch knockouts, etc. supposedly demonstrating internal power, Chi-Power. As much as those video clips can be found at youtube, stay real. The ease and simplicity of Wing Tsun Kung Fu! Now I can see already some of our members smile, to say the least. Wing Tsun employs pure physics, is being taught using easy to understand core concepts you can 'lay over' any partner exercise or form like a guiding blueprint. Wing Tsun training does not require extreme stretching nor complicated acrobatics. Wing Tsun is not very exciting to watch, but works as a highly specialized self-defense system to combat violence in a physical confrontation you were unable to avoid. You do not need to be strong to the max or lightening fast, which does not mean you should be weak and slow either. Wing Tsun training will wake up your hidden potential. The self-defense system of Wing Tsun tailors itself to you personal abilities, transforming you from a perspective victim status to a healthy level of confidence, and awareness of your surroundings, let's you deal with problems before they even arise. Like anything in life, what looks in the end easy and simple requires a dedicated and intense training. What if you never get into a self-defense scenario? For one, then your training has paid off, you have learned to avoid becoming a victim, and look at the "side effects" like improved posture, body awareness, reliable self-confidence, ability to communicate more clearly by recognizing signs of possibly dangerous situations before they entangle you. Many martial arts offer many things, and then some self-defense. Wing Tsun Kung Fu is self-defense, period. Thanks for the e-mails asking about the next blog entry. I appreciate you coming back time and again to the blog of Wing Tsun Kung Fu Vancouver. How reliant have we become on using the various tools of the Internet for sending and receiving information. Everything is at our fingertips, and we realize the ease and simplicity of access only once it is cut off, even if only temporarily. For about ten days I was back in the dark ages with agonizing dial-up, the computer constantly signing off, losing the Internet connection while attempting to send e-mails or upload files. Now my broadband connection has been reestablished and I am glad to share a few minutes with you. I will respond to your questions and further elaborate on past mini articles in this blog. Send me a e-mail at SifuRalphHaenel at aol.com. Looking for past entries of interest? Find you links here! Vancouver video, Seminar feedback, How to bring Chi-Sau to life! On March 23rd I added for the first time a few links to video material about Vancouver. Many, who are reading this blog, have been to Vancouver before or plan on visiting soon. So, here is another batch of links from Tourism Vancouver, Vancouver 2010 and other sources (links 1, 2, 3, 4). 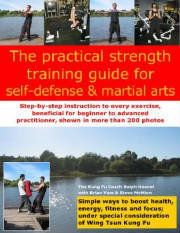 Steve McMinn, personal trainer and the author of the seminar feedback article, is featured in the upcoming book "The practical strength training guide for self-defense and martial arts" as listed for release by mid May 2007 at www.kungfutheworkout.com. How to bring Chi-Sau to life! As always, the mini articles in our blog are intended to encourage a analytical training, to promote the ability to look at your exercises and the understanding thereof from different viewpoints. The articles are by no means supposed to be complete. Anybody who has experienced training with practitioners of different wing chun styles found out soon enough that Chi-Sau (clinging arms) as training method may not be compatible. You train Chi-Sau with your training partner, you learn Chi-Sau from your instructor, you teach Chi-Sau to your student, with anybody else you employ the end result of intense Chi-Sau training, you demonstrate or fight. I wrote already earlier in the blog about the different wing chun styles. Let's just say that the training goals and effects are viewed differently, which is more than understandable in a highly interpretive art like wing chun. wing chun stands as a synonym for a variety of different Wing Tsun, Wing Chun or Ving Tsun styles. When talking about Wing Tsun Chi-Sau let's look at possible variations of your daily or weekly training routine. First of all, training partners or even other instructors who differ in height, reach, weight, strength, let alone skill and ability require for your progress a very patient and dedicated instructor who can adjust the exercises to your very specific needs. 1. Now, let's start with distance. Train with your arms as far extended as possible without loosing the ability to maintain contact, balance or proper responses. Train in the ideal distance with movements as trained in your forms (Siu-Nim-Tau, Cham-Kiu, etc.). Now work as if your positions are almost completely collapsed, in the closest range possible. 2. Another variation is speed. Begin with correct but extreme slow-motion movements, switch to 'regular' training speed, then try to work with extreme speed. Here, during the last application, you may encounter a drastic drop in accuracy and ability to maintain contact. 3. Let's continue with pressure, starting out with a touch, which can barely be felt, resume with 'regular' pressure, and finish with very heavy pressure, under which you begin to understand how different muscle groups indeed have to be connected from toes to fingertips to maintain a stable yet highly movable structure. Some of you might now ask what 'regular' means. This is of course almost impossible to describe with words. Feel free to join us for our next Open House event. Why have we chosen only three variances in these three groups of exercises? You can of course choose as many as you would like; three stands more or less for minimum, optimum and maximum of a particular exercise. The preceding ideas are only a first few to bring some dynamic into your Wing Tsun Chi-Sau training. Go here to find an overview of past blog entries of interest! I hope you enjoyed a relaxing long weekend. Mark your calendar today for the next events at Wing Tsun Kung Fu Vancouver. 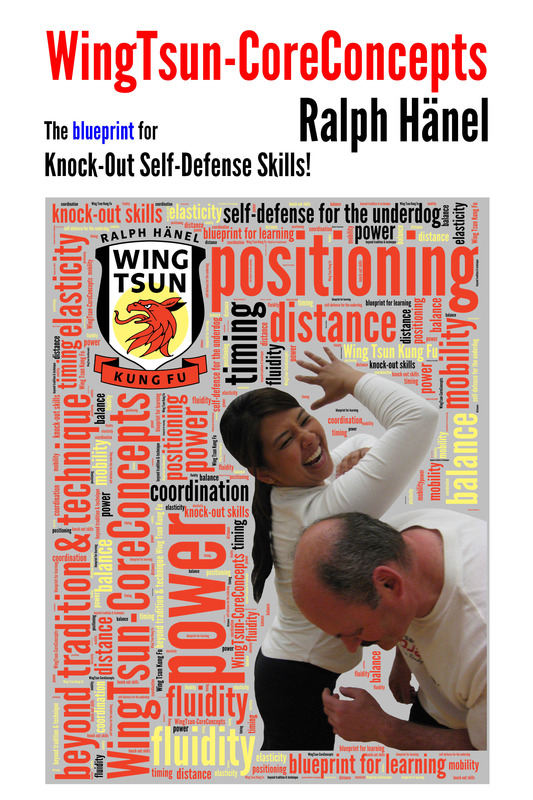 We have scheduled the next WingTsun-ChiKung class for Monday, April 16th, 7-10pm. This evening will feature the Cham-Kiu form, the second form of the Wing Tsun system. Click here for more information. The next Open House is ahead of us, on Monday, April 23rd and Wednesday, April 25th. Click here for more information. We have also started preparing for this year's second special topic and grading seminar. The date has been set for Monday, May 14th and Wednesday, May 16th. Have you had a chance to download the newsletter for April? Sign-in now at the online ' members only ' area. Visit us tomorrow for a brief review on how to bring Wing Tsun Kung Fu Chi-Sau to life! Healthy critique or interrupted learning process? Your instructor has just demonstrated a new exercise. He explained in detail what the purpose of the exercise is, how you should train it, he even showed it in slow motion for the finer points. Maybe on top you were told what not to do, in order to ensure your progress. I for example often encourage to train it a few times purposely wrong. Only if we know common mistakes we can go into the right direction. I ask not to hinder each other, rather to help each other, even though that would seem to be the most normal thing in the world. I urge not to fight each other, since each training partner first has to get a feel for the exercise. When I show an exercise in different angles, with different outcomes, I point out that this is a "finished product", a ability to move, strike, counter, etc. that has to be achieved first. Furthermore differences in height, reach, experience, weight, strength, speed, even personality can heavily influence the outcome of a exercise. Training partners have to work WITH each other, to eventually after long training reach a level of intensity at which they can test "the finished" exercise against each other. But even after ideal explanations and demonstrations what happens at times? You just get started with your training partner, and ... ??? he starts to point out that your Wu-Sau was too low, that you should have turned earlier, that your punch didn't perform according to the distance, and the list goes on. You start thinking, hey just wait a minute, you are doing the very same things, besides we have just started to explore the exercise, and if I remember right haven't you missed quite a few classes recently, and all you do is trying to correct me? Having experienced this behaviour everywhere, I know it is human nature, the I-know-it-better effect. Just a short while ago I read a very interesting article on the web site of the EWTO. "When correction is a disturbing factor" Why it is not good to constantly correct your training partner, and why it is also bad to give a running commentary during a lesson. Grandmaster Kernspecht and guest author Sifu Lars Böckers on “bad habits“ during WT training.